When it comes to keeping things neat, organized, and readily available, you just can’t go past a clipboard. This humble office item might have been around for as long as we can remember, but that doesn’t mean that it’s gone out of style! Recently, bloggers from all over the world have been reaching for paints, paper, and glue to transform their once-boring clipboard into its very own work of art. We’ve actually rounded-up 30 of these amazing tutorials below so that you too can reproduce their incredible results. From florals, gold leaf, and polka dots to chevron, stripes, and everything else in-between – we have a feeling you’ll be bookmarking more than a few of these! Aren’t these painted clipboards from A Bubbly Life wonderful? They’re bright, creative, and super eye-catching too! This pretty heart pattern clipboard is so easy to create, you’ll probably want to make more than one! Thankfully, A Bubbly Life will show you how via her tutorial on Pottery Barn’s blog. These DIY fruit clipboards from A Girl and a Glue Gun look divine! They’re the perfect office accessory to help you celebrate summer. 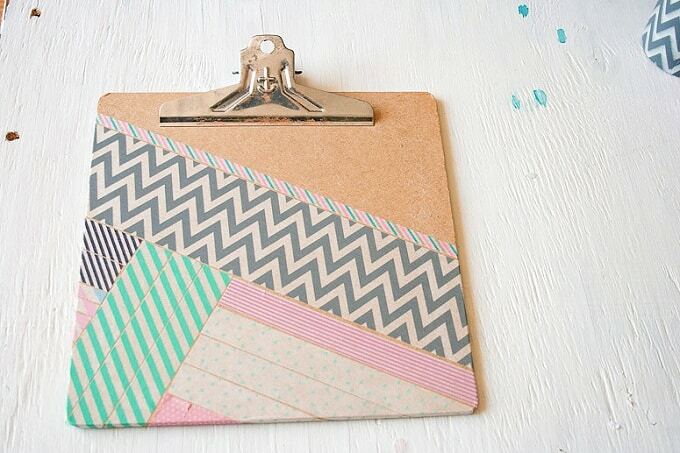 Did you know that you can even use Washi Tape to decorate clipboards? Blitsy Crafts has this wonderful step-by-step tutorial on YouTube for you! This fancy-looking clipboard isn’t actually that hard to create – just ask Callaloo Soup! We love the assortment of colors and patterns. Wow, you can even create a gallery wall by giving some clipboards a makeover! Crafts by Courtney is here to show you how. What a pretty little pink clipboard easel from Damask Love! You can mix and match your own DIY version in any color that your heart desires. Gold, glitter and stripes – is there any better combination than that? DIY Candy’s brilliant DIY clipboard would also make a great present for loved ones. We adore this DIY clipboard from DIY Candy and the way that she has turned it into a work of art! Want to create your own? Be sure to follow the step-by-step tutorial. 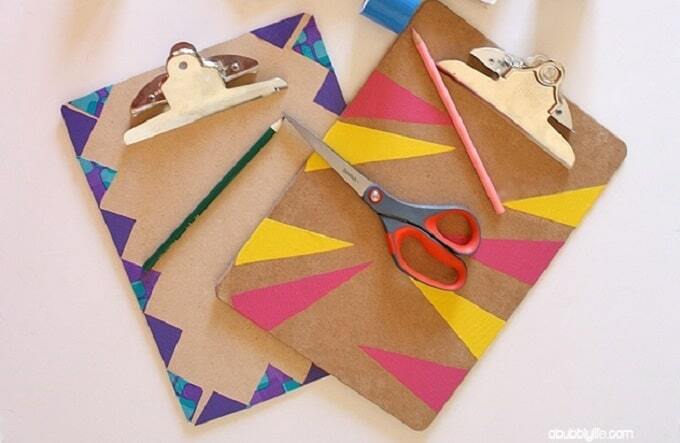 This patterned clipboard could not be easier to make! It’s the perfect project to whip-up in the smallest of spare time, so check out Engineer Mommy to see how. Who knew that creating your own marble clipboard could be this easy, plus it would only cost you a few dollars? Fabric, Paper, Glue certainly did! Gathering Beauty has created these beautiful patterned clipboards and it cost her next to nothing! They serve as the perfect frames for inspirational quotes too. You can even turn an old clipboard into this gorgeous organizer, just as Gathering Beauty has done. We love the colored chevron pattern too! If you love horses and a stylish color palette of black, white, and gold, then you’ll adore this DIY clipboard idea from Horses and Heels. It’s gorgeous! You can also create a clipboard with a difference, just as Houseful of Handmade has done. This stunning white frame looks like something from a high-end boutique! Here’s another clever blogger who turned a clipboard into a work of art. We love the inspirational quotes that Jamie Pate has used too – very pretty! Jane’s Apron was inspired by a patchwork quilt when she created this stunning DIY clipboard. The button detail on the clip is so clever! If you love that high-end but rustic touch, then this DIY clipboard idea from Live, Laugh, Rowe is for you! What gorgeous print or photo will you clip onto yours? Lovely Indeed has discovered the most beautiful way to document a holiday – through creating your own travel memory clipboard! We love the vibrant colors and hint of gold. Metallic gold and brushstroke patterns are incredibly on-trend right now, so this DIY clipboard idea from Lovely Indeed is sure to delight everyone! We love the angled paint, as well as the pastel colors. It’s amazing what you can create using some Mod Podge and scrapbook paper! Miss Woodward’s Class actually used the materials to make some gorgeous DIY clipboards. You might have to look twice at this one to discover that My Fabuless Life has actually created a clipboard using a wooden serving board – isn’t that clever? You’ll certainly want to follow her tutorial to make one for yourself! 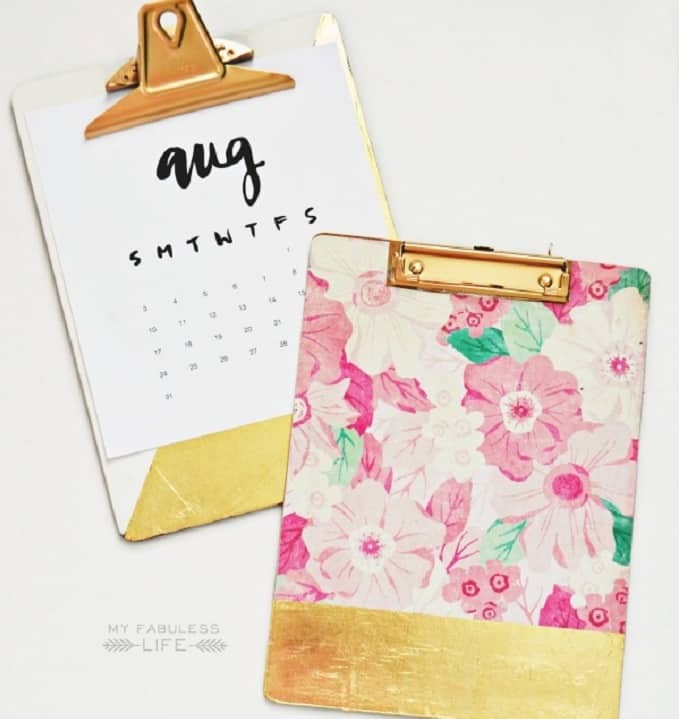 My Fabuless Life certainly loves creating DIY clipboards – she’s even made these stunning gold leaf versions! We think the combination of florals and metallic gold is a winner. Stay organized with not one, but 6 DIY clipboards mounted on your office wall! My Frugal Adventures decorated hers with gold stripes and vibrant colors. How about creating a clipboard that stands up? Pretty Handy Girl created this clipboard and stand in order to showcase recipes and other awesome things. We think it’s a great idea! You can even make a clipboard to suit every loved one, thanks to this simple tutorial from The 3 R’s Blog. What patterns or colors will you choose? This pretty DIY clipboard from The Dean’s List has a certain Rifle Paper Co. look about it, doesn’t it? The good news is that it cost a fraction of what a clipboard would cost from that amazing brand, so be sure to check out the full tutorial! Andrea from The Cottage Market has created these DIY swallow silhouette clipboards for The Graphics Fairy and we think they’re amazing! Gold patterns and black and white polka dots will always be a favorite. Think, Make, Share has come up with five fantastic DIY clipboard designs that you or your children can have fun creating. Our personal favorites are the pom pom and white botanical drawing designs. Here’s another example that you can never have too many florals or polka dots! Wayfair has this simple yet stunning DIY clipboard idea to show you. There you have it – 30 DIY clipboard makeovers that you’re sure to love! Which projects were your favorites? We’d love to hear from you in the comments section below!